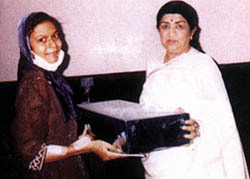 Lataji became the 5th women to receive the Bharat Ratna (Jewel Of India). This award has been conferred to her not only because of her unparalleled contribution to Music but also because of her contributions towards her country and its people. As Lataji says "Ultimately, for me the country means everything and for keeping its name and fame high, I will do anything." Pandit Onkar Nath, the great musician, appealed to all Gujarati young men as far back as 1949 to join RSS. When RSS workers needed some money to liberate Dadra and Nagar Haveli, Lata Mangeshkar gladly gave a charity performance for them in Pune. In 1985, Lata performed in a charity show in Toronto, this was the first time that a 3rd World Artiste performed for a 1st world charity organization and collection of over $1,50,000 were made which Lata donated to the charity organization. On 5th March 2001, Lataji organized 'Aye Mere Watan Ke Logon' for the Gujarat Earthquake in Jan,2001. Prime Minister inaugurating Deenanath Mangeshkar hospital in Pune (Nov 1, 2001). 1st November, 2001 will be a special day for the Mangeshkars. The dream of Lata Mangeshkar and musician Hridyanath Mangeshkar's actually saw the light of the day when Prime Minister inaugurated their State-of-the-art hospital in Pune. Speaking to the press Lata said that she had still to gather funds for the cardiology unit and would do so by organizing live shows. Lata also promised that the hospital would give free medical aid to patients with financial constraints. Actors Amitabh Bachchan, Aamir Khan and director Yash Chopra have already contributed towards the hospital. The Mangeshkars also hope to start a home for the aged. Her voice has touched the hearts of millions and so has her deeds. Make a Wish Foundation : An organisation dedicated to fulfilling wishes of children suffering from life-threatening illnesses. Madhulika (suffering from a terminal disease) had a great passion for music. She felt that if she met Lata Mangeshkar, the nightingale of India, she would better her own singing. It appeared that such a genuine wish was meant to be granted at the earliest, because the very next day, Lataji agreed. During the meeting, Madhulika was moved to tears. She returned home feeling she had lived a beautiful dream which would last lifelong. Harish Bhimani, basically a voice-over artist & orator, he has been compering Lataji’s live concerts both in India and abroad for more than two decades. He pens his experiences with Lataji, understanding her from his perspective, some anecdotes about various experiences and incidents in her life that Lataji had narrated to him herself and neatly integrates them in the book. He simply takes the reader on a guided tour In Search Of Lata Mangeshkar. Lata Mangeshkar - A Biography, by Raju Bharatan is mixture various stories that this professional film journalist had put together. The author claims, his work is basically analytical, at the same time, critical in those areas where, logically no punches should be pulled. The book gives an insight into the life of Lataji, from the perspective that is typical of Bollywood.